□ Its wings and batteries come from Japan. Its wing tips come from South Korea. □ India is the source of its floor beams. The front fuselage is made in the USA and Japan. □ The center fuselage and horizontal stabilizers are from Italy. □ Landing gear and doors? France. Cargo access doors are built in Sweden. □ The wing/body fairings, which cover gaps on the body, are from Canada. □ The movable trailing edge of the wings are from Canada, except when they’re from the US or Australia. □ Thrust reversers come from Mexico. Over the next 8 years, the President clearly has an opportunity to replace many of these imports with local parts. But he is unlikely to be able to do this without impacting Boeing’s business model, which is based on accessing the world’s best brains and factories to produce the best possible aircraft at the lowest possible cost. 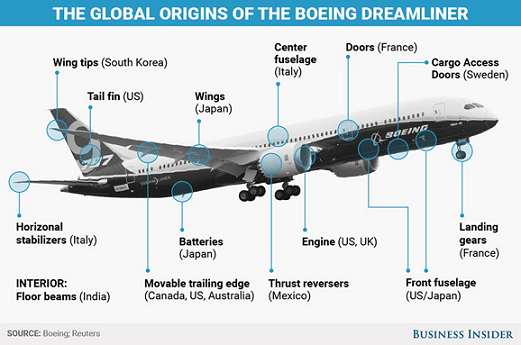 This model also creates a “win-win” for countries when buying the Dreamliner, as they are able to share in the value being created. If Boeing changes its business model to a “win-lose” model – based on increasing US content at the expense of foreign suppliers -then its sales will inevitably suffer. Trade wars will replace today’s global supply chains. In reality, of course, May has no control over whether auto suppliers choose to locate in the UK. Nor can she guarantee that UK car exports will continue to have free access to the EU. 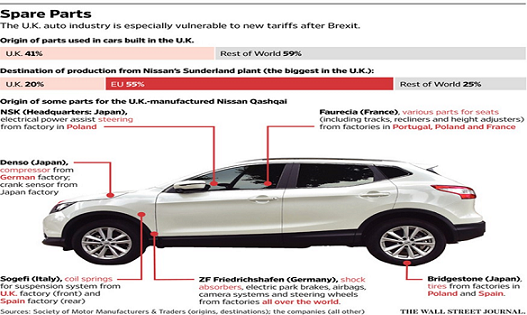 What therefore will happen to the UK’s critically important auto industry if she proves unable to deliver on her promises? We already know that the EU plans to focus the Brexit negotiations for the rest of this year on finalising the UK’s exit bill (estimated at €60bn, $57bn) and the rights of expatriate citizens. This means the UK will have just a year to discuss longer-term trade deals before exiting the EU in March 2019. Almost inevitably, this means the UK will then be forced to use WTO terms for all its trade – with the EU and the rest of the world – until new deals can be finalised. History shows that nobody can control what happens next in any war, or trade war. Usually, the “winner” decides they can make further gains, and the “loser” tries to regain what they have lost. Today’s trade wars are following this pattern. They are starting slowly and locally, but will soon spread globally as the list of losers starts to multiply.